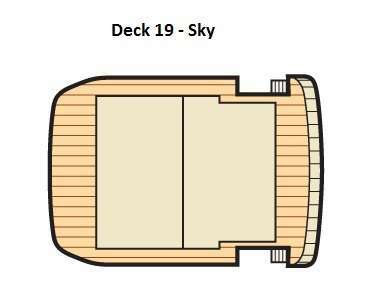 The first of the royal-class vessels, the Royal Princess is the crowning glory of the Princess fleet. With a capacity for more than 3,500 passengers, the Royal Princess is a great all-around ship for a traditional cruise experience with a few modern touches. Princess classics like Movies under the Stars, the three-deck town square “Piazza,” and variety of entertainment options for all ages are still there. But the updated restaurant selection, refurbished staterooms and a vertigo-inducing glass walkway over the water put this ship in a class of its own. For those looking for a traditional cruise with diverse dining options, a casual atmosphere and plenty of shore excursions, Royal Princess would be hard to beat. 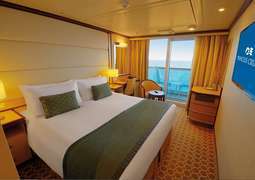 Updated furnishings in Royal Princess staterooms give the ship a modern touch. Amenities such as more electrical sockets, bigger showers and improved bedding materials are designed to improve customer comfort and convenience. 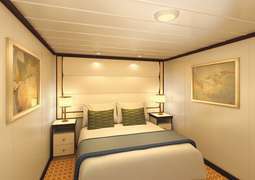 More connecting cabins make the Royal Princess a great ship for families, and a new class of stateroom, the Deluxe Balcony room, gives guests more options than others. A spacious balcony, separate living room area and special access to certain onboard services are just some of the privileges guests can expect when they book suite-class staterooms. With 16 different restaurants, cafes and grills, there’s something on board the Royal Princess to appease every palate. Alfredo’s Pizzeria, the Trident Grill and the International Café serve comfort food in a flexible environment, whereas Traditional Dining caters to those who prefer a more classic cruise culinary experience, with fixed seating and the same waitstaff every night. A new specialty restaurant, the Chef’s Table Luminiere, is perfect for special occasions, serving multiple-course gourmet dinners with fine champagne. An Italian restaurant, a steakhouse and a seafood shack expand the diversity of the cuisines. On the Royal Princess, entertainment is key. A new onboard television studio allows passengers to experience firsthand what goes into producing a show and allows them to be part of a live audience. The show, Princess Live!, is available on the ship’s televisions daily. Four new musical performances made their debut on this ship, and expanded areas for kids and teens make sure every cruise passenger has the best experience possible. The luxurious Lotus Spa is located conveniently at the center of the ship next to the Piazza, making it easier than ever to reach. The dress code onboard the Royal Princess can be generalized as smart casual, with passengers encouraged to wear pants or nice jeans, a collared shirt or blouse to dinner. On formal nights, passengers tend to go all out, breaking out the ball gowns and tuxedos. But if you forgot to pack your fancy duds, don’t worry – these items are available to rent if you plan in advance. And passengers who prefer to keep it casual are always welcome at the buffet. 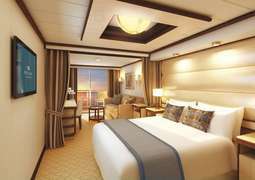 The Royal Princess, a cruise ship operated by Princess Cruises is sure to delight its passengers with an evolutionary design. Introduced in June 2013, this big sea resort carries 3,600 cruise guests on a ship that brought several innovations as well as signature amenities that differentiate the new vessel in its competitive set. Royal Princess features diverse entertainment, including parties and theme nights, world-class art collections, galleries and auctions, and other features. The wellbeing of the passengers on board the Royal Princess is one of the ship crew’s priorities. With the wellness facilities, such as Lotus Spa and golf practice cage, being of superb excellence, the passengers have a variety of sports and activities to choose from. Get your heart rate pumping with a choice of exercise classes such as jogging, paddle tennis or yoga, or make use of the machines in the gym and fitness area. After, enjoy a deserved chill down by the Retreat or Fountain Pool. Dream worthy destinations on board the Royal Princess! The beautiful ocean liner cruises North America, taking you to fabulous cruise locations such as Canada and New England, as well as various locations on the Pacific Northwest. In Canada you could visit the capital city of the Canadian province of Quebec, Quebec City, or other beautiful spots such as Halifax, Saint John and Charlottetown. In the Caribbean, there is George Town, St. Maarten, San Juan and Grand Turk which are all sure to wow and delight you with their music and dance as colorful as the reefs. Along the Mexican Riviera the places of Cozumel, Cabo San Lucas and Puerto Vallarta are all stopovers for cruises with the Royal Princess. Your time both on board and on land is sure to be amazing and memorable with the Royal Princess.